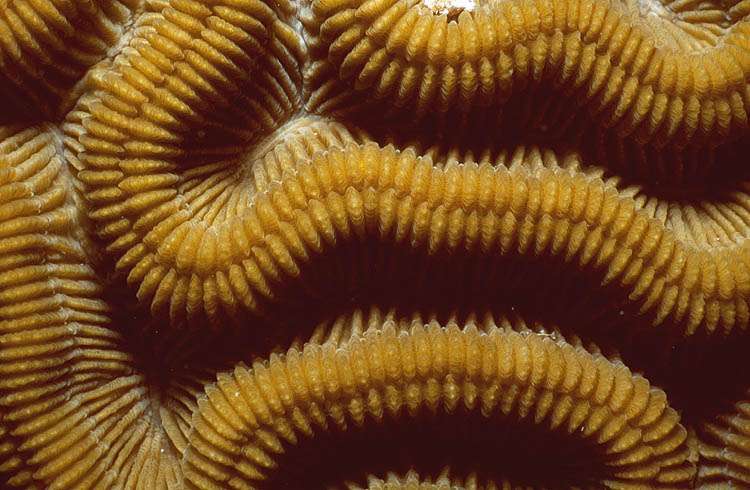 This ultra closeup of a Brain Coral shows the detail of the ridges and grooves on this stony coral. The Brain Coral is called a stony coral because these animals build a hard skeleton out of calcium carbonate using minerals the animals get from the ocean water. The surface of this skeleton contains many rough ridges, and the coral animals live in the crevices between these ridges. Individual coral animals are called polyps (say, "PAH-lips"). There are about 16 polyps living on the surface of the coral in this picture. The Brain Coral in this picture is about 3 inches wide. Notice that the ridges have many tiny grooves. The polyps have tiny tentacles that they use to catch food. During the day, the tentacles hide in the tiny grooves on the sides of the ridges for protection. If you look very closely at these grooves you can see the tips of these tentacles, which look like a shiny brown spot in the groove near the top of the ridge. These tentacles are easiest to see near the middle of this picture. Click here to see a Closeup picture showing more of a Brain Coral. Click here to see an entire Brain Coral colony on a healthy reef near Bimini.